If you are the parent of a preschooler, then you are going to be pretty excited about today's Back-to-School Fiesta giveaway! Over the past year, I've acquired quite a few materials for preschoolers in both English and Spanish. Some I've been sent for review, others I've purchased with this in mind. 1 set of Stuart J. Murphy's I See I Learn books: Percy juega con cuidado, Freda organiza una merienda, Emma hace amigos, ¡Bien hecho, Ajay! 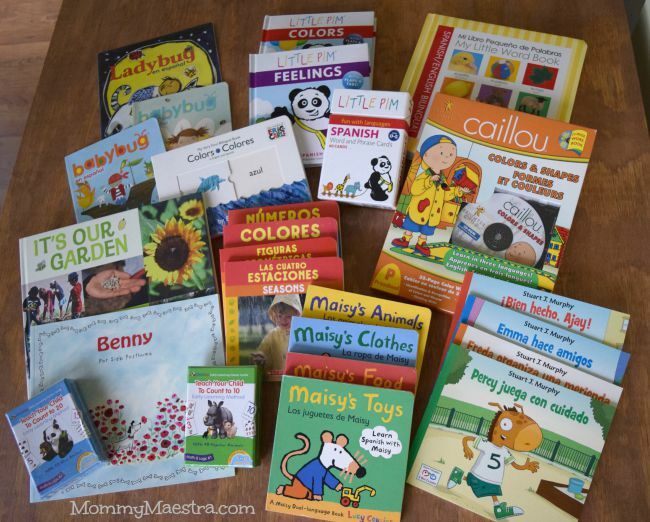 ONE MommyMaestra reader will win this comprehensive bilingual preschool prize pack! To enter to win, simply use the Rafflecopter below. I thinking about homeschool my almost 3 year old boy but I feel very insecure because I'm a native Spanish speaker with a degree in Communications but my English is Ok but not perfect. I think the early bilingual education is the best for us. My husband is a native English speaker and my son is bilingual already and find your blog gave me hopes about homeschool him. Thank you. I'm homeschooling preschool bc I don't want her to attend preschool in the community language (her English is awesome; Spanish could use some work). It's also important to my husband and me to keep our lives moving slightly slower than the average frenetic pace at which our community runs. And, finally, just to have that time with her. I want to expose my son to Spanish as early as possible! I came across this blog today as I was looking at curriculum for my freshman home school student. My daughter and her husband are missionaries in Dominican Republic. They have two preschoolers. I'm excited about the possibility of winning this so I can pass it on to them to use! I teach my child at home (in addition to an outside preschool) because I've found that the deepest learning is that that we repeat day after day after day at home. I'm amazed at how quickly and how much kids can learn when you just put in the time. The resources you list on your site are so helpful to me in my pursuit of teaching my children Spanish in an English-speaking community! Thank you for all you do. Even if I don't win this preschool pack, it's a wonderful list of resources that I can refer to for my preschooler. Thanks! Thanks for the opportunity! You are such a fantastic resource! I think I might give this to my bilinqual neighbor and her child.. I know they will love it! What an amazing giveaway! I preschool my children at home because I am always looking for ways to incorporate the Spanish language as well! I have been helping other preschool parents learn of great bilingual resources to use at home too! These would be great resources to share with them also! I really need these books for my bilingual twins! My son will attend a 3 hr daily preK program, but we all know that learning doesn't stop at school. My kids are constantly learning at home and in the world and we encourage questions, reading, activities, etc to foster a love for learning. I teach my 2 boys ages 4 and 3 along with my baby girl that's 8 months old the importance of being bilingual. I am Mexican and I feel strongly about them knowing they are too. I love that I am their first teacher. There are things only parents can teach such as their personal heritage, culture, morals, values and instill the motivation for them to do as they wish with their lives to contribute in a positive manner to this world we live in. I believe their education begins way before preschool. I love teaching my kids. This collection would be amazing for them! This is awesome, my boy is headed for PreK this year and loves books. Since we are raising bilingual having more books that we can read in both languages will be great. Love this giveaway and love your blog! I teach my four year old at home so I can emphasize Spanish. I am a non-native speaker, but with perseverence and LOTS of reading, I taught my 5 children to speak Spanish--now they use their second language daily in their professional careers! I'd love to share this awesome collection with my young godchild who is learning spanish with me. I am starting preschool at home with my son this year. One of my big goals is to learn spanish together. I'm so glad I found this website! So many great resources!